RE-invented style: RE-inventing Camp: MOM camp aka best camp eva! RE-inventing Camp: MOM camp aka best camp eva! This is MOM CAMP PART 1. 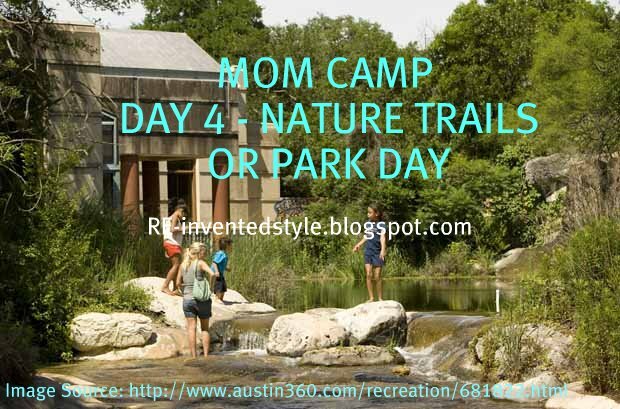 A link for MOM CAMP PART 2 is at the end of this entry. 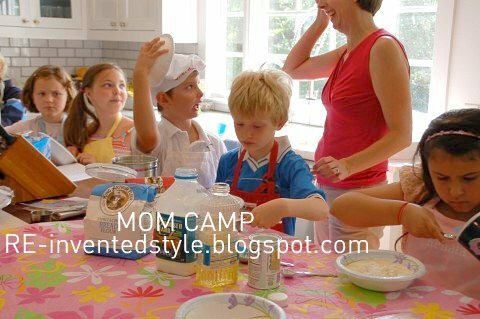 WHAT IS MOM CAMP? For the last few years, my friends and I have done a 1 week summer "MOM CAMP" that is basically a cooperative camp. My book club has 10 ladies in it and most of us met because our first kids are about the same age. My friend, Martha, came up with the idea that our book club could organize our own camp for our kids by sharing our different talents with all the kids. My group of friends loved the idea. 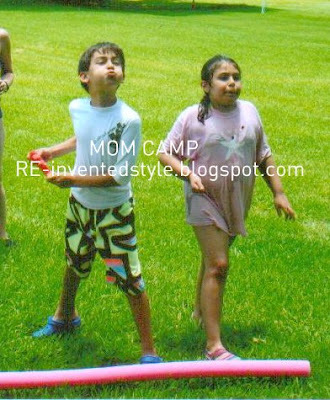 We greatly enjoy that our kids are growing up together and now that they go to different schools, MOM CAMP gives them a good opportunity to continue their childhood bond. We also are blessed to have really good kids that we hope will be a good influence upon each other as they develop new friendships that may not always be the best influences on their behavior. 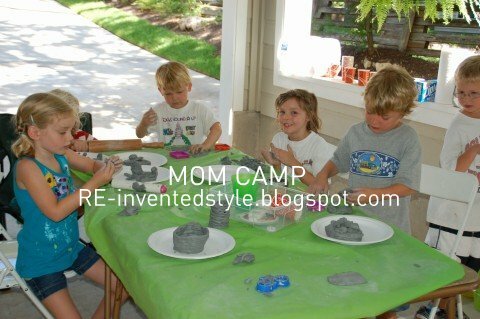 I was thrilled by the MOM CAMP idea because there are many talents I lack which my friends have (e.g. 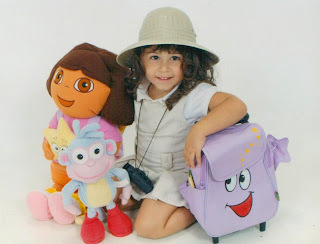 culinary, sewing, scientific) and MOM CAMP allows my child to learn from my friends while I reciprocate by sharing what I have to offer with their kids. Plus, the moms would get to spend time together which we love. A big win all the way around. 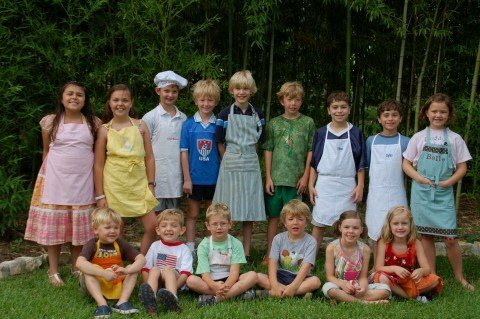 Above, our kids are posing for a picture on COOKING DAY at Martha's house. This was our first day of MOM CAMP. HOW IT WORKED: We had 10 moms so 2 moms were jointly responsible for 1 day of camp. That allowed the moms who work outside the home to participate because they would only have to take one day off from work. It also worked because fortunately, our kids are mostly school age and well-behaved so 2 moms would be enough to handle the whole group in most situations. My friend, Kerry, has the youngest child (a toddler), so she sent along her babysitter to watch after her to make sure the other moms weren't spread out too much. If any of our children had behavior issues or really special needs, then it might not have worked unless that child's mom attended to look after him or her. The kids would be dropped off by 8:30 or 9 and picked up in the afternoon. Some moms kept the kids for longer than others, but the plan was usually to pick up at 1:30 p.m. COOKING DAY: Most of my friends are great cooks, so this day had a lot of options for leaders. Kerry and Celeste organized it. Above, you can see the kids are preparing dough to make their own pizzas. This day the kids made their lunch, but for all the other days, they took a packed lunch unless the moms in charge decided to provide lunch. This day, the kids also made goop from a recipe Celeste found. Last year, we decided to add a philanthropic aspect to our activities, so the kids made food/snacks for baggies for the poor on Cooking Day along with making their own lunch. Another reason, I really love MOM CAMP is it is a way for our friends to reinforce the values (respect for adults, consideration, compassion) we are all trying to instill in our kids. ART DAY PROJECTS: Martha and I did art day the first year and my friend, Grace and I did it last year. Since MOM CAMP happens in June, we usually have the kids make gifts for Father's Day. Above, the kids are painting $1 wood frames I purchased at a craft store. I also allowed them to paint some wood pieces with slogans like "#1 Dad" and glue them to the frames if they wanted. I already had the paints so this was an inexpensive craft. I took pictures of the kids holding a sign saying "Happy Father's Day" and printed them out on the computer to complete the gift project. CLAY WORKS. Martha likes to work with clay, so she set up a clay station for the kids on Art day to make small bowls/holders for their dads. Last year, we made stepping stones from kits. The moms all agreed they wanted the kids to do the project so I bought the kits and they all paid me back. I bought extra molds and decorative stones and the kids left their stones to dry until the next day. Tshirts, rock painting, paper mache, recycled goods used for art.....this day allows for a lot of creativity in finding supplies for the art projects for any budget. GETTING MESSY? YES! My friends, Kathleen and Linda were in charge of Water Day. The kids were all dressed in swimsuits and above, they are gearing up for a big shaving cream fight before they clean off in the lake. We were very lucky that Kathleen has a lake house, but a swimming pool or a water hose/slide and baby pool full of water balloons set up in a backyard could work for Water Day. The basic element is getting messy and cleaning off with water. OLD FASHIONED FUN. My friend, Linda, hosts a "camp out" party in her backyard in the summer that we all love. Our city kids make hot dogs and smores, sit in tents, run around, catch fireflies and have a massive water balloon fight. 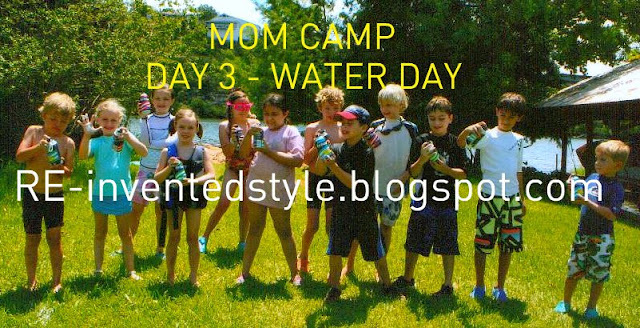 MOM CAMP'S Water Day has similar old fashioned fun. Above, the kids are engaging in a watermelon seed spitting contest. LOL! I'm guessing that was Kathleen's idea, but I'm not sure. SHAVING CREAM FIGHT. I blurred out the mom's image who was engaging in some shameless shaving cream fighting action against the kids to protect her identity *cough* Linda*cough* Btw, protective eye wear can be helpful for this game.. All our kids swim and Kathleen was a trained lifeguard, but because swimming is so dangerous Diane volunteered to tag along on this day to have an extra mom/set of eyes to supervise. NATURE TRAIL DAY. Renae and Diane organized a trip to Austin's nature trails for the kids to observe the insects and animals. I am SUPER sad that I don't have pictures of this day to share. The photo above is an official visitor site pic. Renae and Diane prepared *ADORABLE* insect themed snacks for the kids (apples, peanut butter and pretzels used for spiders and butterflies, gummy worms in bags etc.) and nature observation kits (party store magnifying glasses, note pads with pens attached to write down all the different animals/insects they came upon) and water bottles. They made the nature observation a competitive game. The kids got points for the animals/insects they spotted. The kids got really into it. The nature trail also has a dinosaur pit and the kids dug for stuff there. If your city doesn't have a nature trail for hiking, then a zoo day or day at a farm would be a similar experience. TIME OUTSIDE. For the last day, we sometimes scramble, because not all the moms in our group can participate for the whole week every year. The first year we did MOM CAMP, for the last day, we went to a local park for swimming, playground fun and a picnic. We attended to our own kids. Last year, Celeste volunteered to take an extra day and took the kids to the movies. A local movie theater runs special kids movies for $1 during the summer in the mornings. Martha's husband, Walter and I volunteered to help with supervision. After the movie, Celeste had all the kids over to her house for free play time. SCIENCE DAY - plan 2-3 experiment stations at home and break up the kids to do them supervised or alone. SEWING LESSON DAY - Set up tables with sewing projects (e.g. sewing buttons on) at home. Both boys and girls could use this life skill! ZOO DAY - Most zoos have special activities during the summer in addition to petting zoos. FARM DAY - Got a friend with a nearby farm or ranch? Let the kids be farm hands for a day. City kids will especially learn a lot. MOVIE DAY - At home or at the theater. Great alternative if bad weather ruins a planned outdoor day. We do not charge money for MOM CAMP so it is a social function, the same way hosting a kids party would be. The moms in our group are all responsible as are our kids. It is important to find responsible adults to be in charge. For the safety of all, it is also important that kids who need extra supervision (e.g. very young, behavior issue or special needs) receive extra supervision or be excluded. Moms are not professional caretakers so no one should be placed in a position of taking care of too many kids or being spread out too much to properly supervise the entire group. The Buddy system was always used. Even on days when we were at someone's house, the kids were all assigned a buddy (or two) to stay with so the moms could keep track of everyone more easily. Cost is not that great, however, it is up to the moms to decide budget for their day. Most moms bought most of the supplies, but if some projects were going to be $10 per kid or more, we decided to chip in extra to cover that. We also sent lunch with the kids. I am not sure if this camp cost less than sending my daughter to a regular camp would have (because I am bad about sticking to a budget in a craft store) however, MOM CAMP allows her to spend time with her childhood friends and be influenced by my friends, so that adds a lot of value to the camp imo. If you belong to a social club or if you are close to neighbors or relatives with young kids, then you could unite to pull off a MOM camp. It is a pretty cool camp for a week. A lot of our kids have said it is their favorite summer camp. Madeline Birthday Party discussed HERE. What a fantastic idea!!! Most of us have toddlers but I am definatley going to remember this when they are older! Thanks for sharing! It is a great time. I hope you consider doing a mom camp. I highly recommend it. Thank you for visiting and leaving a comment btw. LOL! Yup, that is so true. The boys love Water Day especially. It is so much fun to play with them. So glad you liked the idea. Thank you for visiting and leaving a comment. 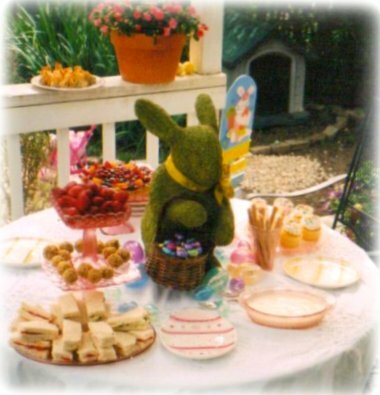 BTW, I found you via Debbiedoo's newbie party and will be following on Linky Followers. Great blog! Glad you like the idea. Martha's kitchen if really great. 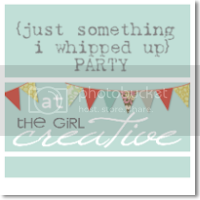 I've taken pictures of it decorated for parties in other entries. I may make a special entry just on the kitchen though if you would like to see more of it. Martha would definitely let me take a home tour set of pics. We are pretty tight and she is very supportive of my blogging. I am glad you are interested in following our blog, but I do not see how you are following it. The Google friend connect number and our linky followers number is the same. I looked for you on my dashboard and I don't see it. I also don't see you on my dashboard for my email feed. Sometimes, things don't go thru the first time we try to follow someone. You might double check if it went thru for you. Love these ideas! A few moms in my neighborhood are home during the day in the summer. It would be fun to organize something like this for the kids, and we could include school friends, too. Thank you for visiting and leaving a comment. So glad you liked the ideas. We love Mom Camp. I hope you can use the idea, too. It is very fun, but you can definitely include moms that work outside the home, too, if you plan it so moms only do one day which opens up the group a lot. And you can definitely include school friends, too. If you do MOM CAMP, please let me know. 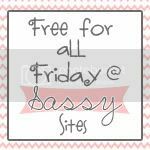 My friends/fellow Mom Campers, and I talked about this blog entry and we hoped the idea would catch on. We'd really enjoy it if it did. Those are great ideas! Thank you for sharing. We moved from another state and I think that would be a great way for my daughter to get to know other kiddos. Thank you for visiting and leaving a comment. So glad you liked the ideas. 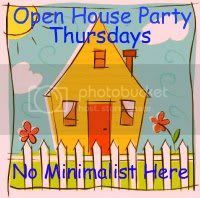 If you just moved, this would definitely be a great way to get to know other families in the area and settle in more. The big thing is to find responsible moms. And just personally, if I were new to the area, the 2 moms per day part would be important to me, so I had a little more security that the parents would be responsible in supervising the kids. I know the moms in my group very, very well, but if I didn't, it'd be comforting to me at least to know I was relying upon the judgment of two moms when leaving my child at someone else's home. But, I only have one so I admittedly can be a little over-protective and cautious. If you do the camp, *PLEASE* let me know. My other Mom Campers and I were talking about the post and hoping the idea would take off. We would be thrilled to know that others took the idea and used it. We are really big fans of it. It is a wonderful way to spend quality time with the kids during the summer. Thank you for visiting, leaving a comment and following our blog. I am so glad you like the MOM CAMP idea. I am pretty happy about it. 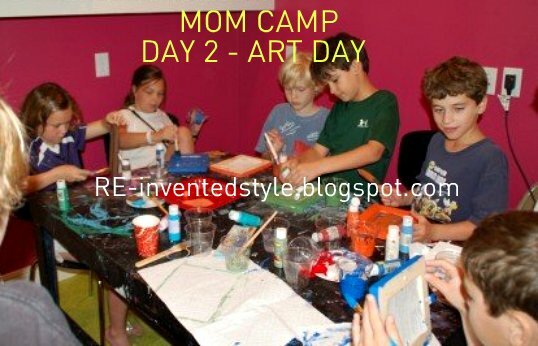 It is very helpful for the kids to be school age, but once they are there, MOM camp really gives the parents the opportunity to do something special that the kids will remember. 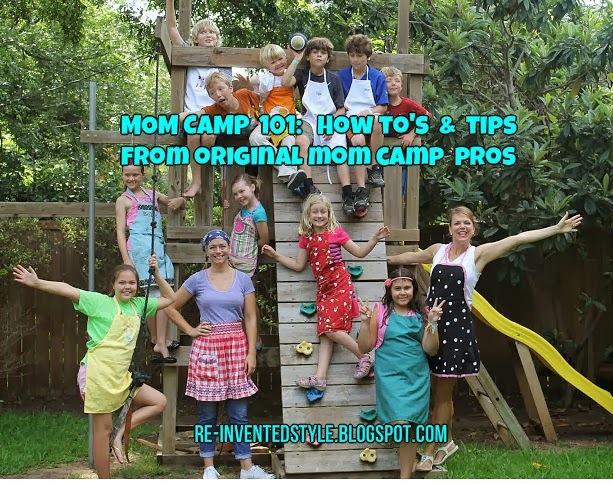 If you do a MOM camp, as I mentioned above, my other Mom Campers and I were talking about how much we hope the idea takes off with others so we'd love to know if you do it. It'd make us very happy. Following now via GFC! Thanks for sharing!! I'm so glad you like the MOM CAMP idea. I am really keen on it. I hope you can use some of the "camp themes" this summer. If you do, please let me know how it goes for you. Or if you need some more ideas on any particular projects/days, just let me know. I'd be glad to brainstorm a bit with you if you need some feedback. 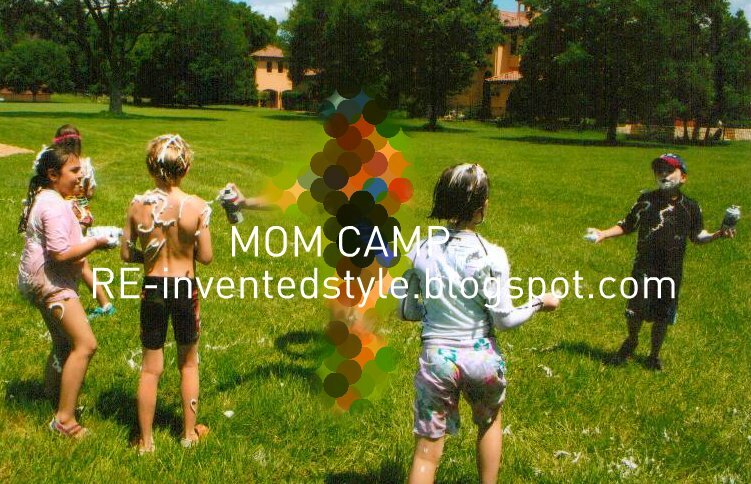 I love the concept of Mom Camp! Makes me wish I had kids still at home and could join in! Oh I seriously LOVE this idea!! 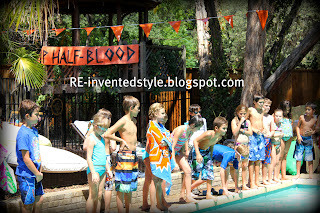 I'm totally going to organize something like this for my friends and their kids this summer. 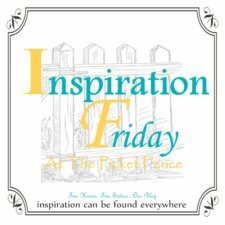 Thank you so much for sharing this with us at Inspiration Friday this week! 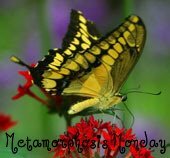 Thank you for visiting, leaving a comment and following on Linky followers. I am so glad you like the MOM CAMP idea. I seriously love it from our experience with it. I hope you do organize one this summer. If you do, please let me know. As I mentioned above, my fellow MOM Campers and I talked about sharing this idea on my blog and we all hoped the idea would take off with other moms. We have enjoyed it so much and feel like our kids get so much out of it that we wanted to share the fun with others. Oh my gosh! This is such an awesome idea! I love it! I might be sending this URL to some friends of mine! I'll be featuring this tomorrow night at Tell it to Me Tuesday! Wow. Thank you for visiting, leaving a comment and following. 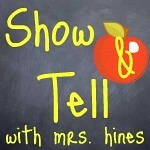 That is so sweet of you to help spread the word by featuring the idea on your blog. Thank you so much. I do hope you can use the idea. If you do, please let me know. 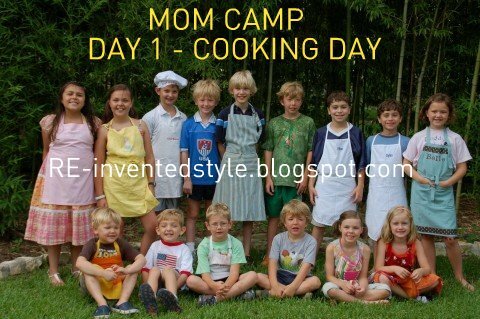 My fellow MOM campers and I would be so pleased to know other people did a MOM camp. Hopefully you and your kids would enjoy it as much as we do. If you do MOM camp and have any questions, please let me know. I'd be glad to be of any assistance I can be. Great idea. Thanks for sharing at Wow. Thank you for visiting, leaving a comment and following. I am so glad you liked the MOM CAMP idea. I am really in love with it myself. And thank you for hosting WOW US WEDNESDAY and giving me the opportunity to link the idea there. Fantastic home day ideas and day trip ideas :) I loved that the work-outside-the-home Mom's kids could be in on the fun and the fact that I'd only have to take one day off is brilliant! My *Ladies* and I do a Big Cook every once in a while, I'm going to bring this to the table next time :) It really is community and provides a takes-a-village mentality that all kids (whatever ages) can come away with positive stuff from :) Yay you guys. 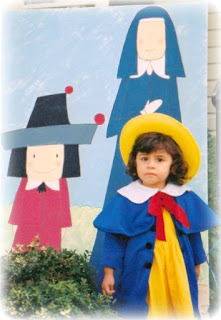 Thank you so much for visiting the blog and leaving a comment. I am so glad you like the MOM CAMP idea. It definitely works for Moms who work outside the home and I totally get you on how much it helps to find ways for your kids to do stuff the stay at home moms' kids get to do. And yes, it definitely creates a sense of community and "it takes a village" mentality in our kids. We all mother each others' kids a bit. I personally find that very helpful. Most of my group are moms without family in town. I am lucky to have my in-laws around to help but most of us are transplants and that definitely makes a difference. Relying upon babysitters who are strangers is different than having family around to help take care of your kids. Our group of friends have become the type of mom support system that we would have had if we still lived in our home towns. It is very valuable to have that and MOM camp is part of it. You become familiar with each others' parenting style and that helps figure out whose house would be a good fit for playdates and whose house wouldn't, if you know what I mean. 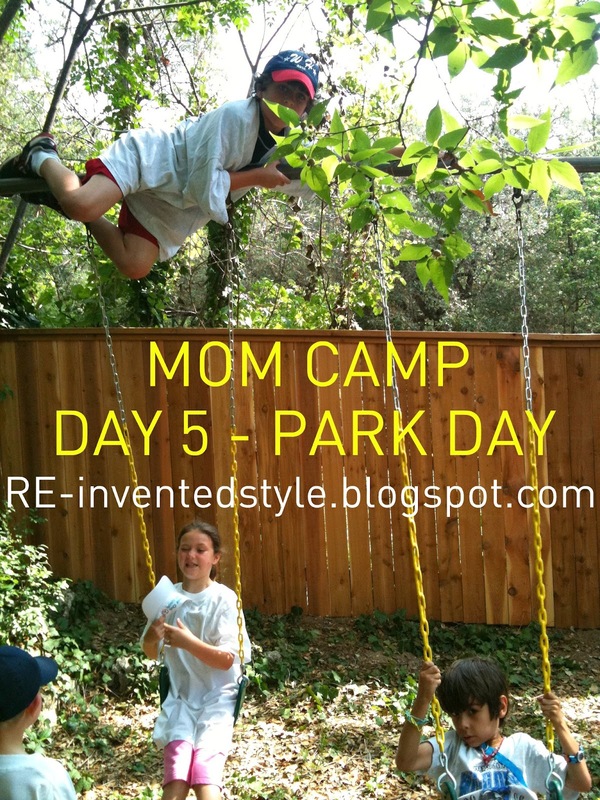 Mom Camp is a very positive experience for us, so I hope you can do one, too. If you do, please let me know. My other MOM CAMPERS and I talked about how I was going to post the idea and we all hoped the idea would take off with other moms. We'd really enjoy knowing other moms did one, too. love love this idea & so going to into our next summer's list of FUN to-dos! What a great idea! Thank you for sharing, and with great detail. You totally answered any questions I might have had. :) I look forward to being able to do something like this with my kids.